THREE SWORDS - Flexible and innovative manufacturer of manicure and pedicure products. "THREE SWORDS - Drei Schwerter" is a traditional "Solingen" company and was founded in 1927 in Germany. 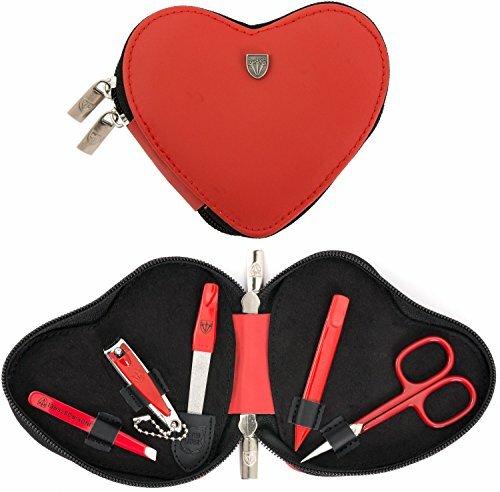 CONTENTS: Cuticle scissors, tweezers, sapphire nail file, nail clipper, nail cleaner. STEEL IMPLEMENTS: Hand made, bright nickel plated (protection against corrosion), red laquered, polished and hardened. All cases come in an attractive gift box. Instruments are made by 3 Swords since 1927. CASE: Genuine leather red, size ca. 12,5 x 10,5 x 2,5 cm. Our organizers are made of high-grade fashion or classic materials. Additional equipment: Microfiber cleaning cloth for cleaning steel items, general info sheet "Finger - Nail Grooming". If you have any questions about this product by 3 Swords Germany, contact us by completing and submitting the form below. If you are looking for a specif part number, please include it with your message.